Intended to build on the growing cultic veneration of the late Pope and add impetus to the campaign to make him a saint, the late Pope John Paul II is the star in a new trip-hop music video backed by the Vatican. The DVD was launched recently in the UK by Universal, and is expected to challenge for the number one spot in the Christmas DVD charts in the UK. It is also expected to sell well in the United States when it is released next month. Music on the DVD, Santo Subito!, is composed by British composer Simon Boswell, who first made hi s name scoring for Italian horror films. The DVD takes its title from the "Make him a Saint immediately" chants cried out by crowds at the Pope's funeral. Boswell describes the music in Santo Subito! as "trip hop, trance-like and contemplative." The video uses footage of the late Pope's visits to places like Africa and Auschwitz, and includes scenes of him greeting pilgrims outside St. Peter's in Rome. Pope John Paul II knew of the project before his death, and would have cooperated with some new material, but by the time the project got underway he was too ill to contribute. 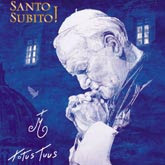 The DVD was produced by the Vatican's very own record label, St. Paul Multimedia. The DVD contains a mix of archived material and never before publicly seen footage. The DVD was released November 19th in the UK, and will be released on December 4th in the United States. It is currently available for pre-order in the US, and is priced at $14.99.